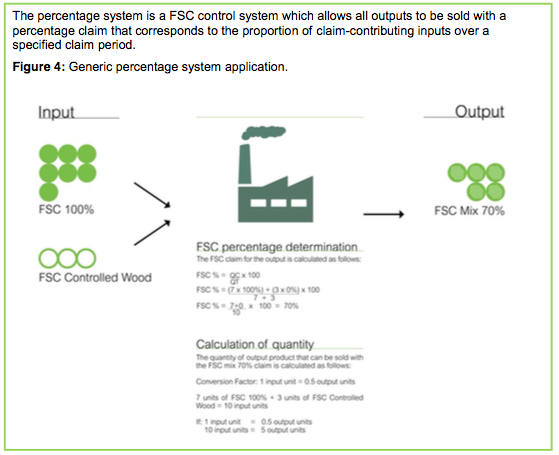 After nearly three years of work, FSC is about to close the second discussion period on Draft 2 of the latest version of its main Chain of Custody standard (FSC-STD-40-004 v.3-0). This latest draft was released on August 31, 2015 and MixedWood posted a brief article on it at that time. Since then, we have examined the draft in more detail; looked over the wealth of supporting documentation; and discussed the subject with our network. We hope that you will be interested in our comments and observations. It is more important, however, that you share your own comments and perspective with FSC. You can find all the relevant details here – including a comment form for stakeholders, and an email for the staff person responsible for the process. FSC needs to hear from all of their stakeholders, and soon. The official comment period ends 31 Oct. 2015. MixedWood has advocated for a simpler and more streamlined approach to Chain of Custody (CoC) for years. Look here for some examples. Our position is simple: Sustainable Forestry will always be hard. Certification should not make it harder. We have been encouraged recently to see signs that FSC recognizes this as well: even including “streamlining” as a critical success criteria in their latest Global Strategy document. Despite the best of intentions, FSC still seem determined to significantly increase the level of complexity in the next version of CoC. This is a shame. The latest CoC draft shows signs of an attempt at streamlining. This is particularly evident in Sections 1, 2, & 3. Several requirements have been consolidated in ways that will be helpful, and some important key concepts (Scope, Product Groups) are clarified. Unfortunately, there is also a tendency to “leave nothing out”. This results in a long list of rather narrow and complex new indicators – mostly related to the long series of Advice Notes that have been collected over the last decade. The latter half of the new standard (in particular Sections 9 & 12) seems to suggest that the drafting committee just got tired and gave up. Here the language becomes lengthy and much less clear. The overall result – sadly – is likely to be a standard that is more difficult and expensive to implement and manage. After three years of hard work and anticipation, this will be disappointing indeed. The fact is that a Chain of Custody standard can be simple and effective. MixedWood has proposed a sample of what this would look like. You can download a copy here. We are absolutely convinced that it will be both practical and effective in practice. We are doubtful that FSC will give our approach any serious consideration, but we stand ready to support it nonetheless. If you agree with our approach, please let FSC know. The greatest blow to simplifying and streamlining CoC remains the FSC initiate to completely restructure the marketplace by requiring new and still untested requirements through its Transaction Verification initiative. This subject remains complicated by the persistent, deep desire on the part of FSC staff to fully implement their Online Claims Platform. We explore this important topic in our next post. We all know that life and business are not simple. The question is: how do you handle the complexities? In this latest CoC draft, we think that FSC is attempting to construct a “perfect” standard. One that will accommodate and address each and every variation in the whole wood product marketplace. We should know by now that this is impossible. And even attempting to provide for every variation is a fool’s errand. That’s all. Everything else is just details and interpretation. Implementation of a standard like this will need to be guided – to ensure effective and fair application. But this guidance should be informative not normative. Guidance can be assembled and published in various forms, including Annexes to the standard, published interpretations, etc. A good example of this can be found in the excellent illustrated graphics found in the latest discussion draft. They are very helpful in explaining and clarifying the meaning and intent of the standard requirements, but they are not requirements in an of themselves. Imagine an auditor trying to raise a non-conformity against an illustration! The idea is foolish. That tells us that the illustration is informative, not normative. The same case can be made for much of the detailed language found in the latest draft. It may be necessary, but it does not belong in the standard. The FSC “Directives” and “Interpretations” systems have been in place for some time and reasonably effective at dealing with the complexities of the CoC world. The chief problem has been in not clarifying what was normative (i.e. required by everyone) and what was informative (intended to guide the application of the standard). For those of you who like details, MixedWood has prepared a short summary of detailed comments and recommendations on the latest FSC CoC draft. We will be providing it to FSC, along with some other related feedback. As always, please feel free to share with friends and colleagues who may be interested. And please be sure to encourage everyone to share their perspectives on this important subject with FSC. In summary, we find the current FSC CoC discussion draft to be generally disappointing, but not alarming. It could (and still should) be improved significantly by the application of more disciplined drafting and a determined effort to streamline, simplify, and clarify. As always, we encourage everyone with a stake in the FSC program to take part in the discussion. Chain of Custody can be simple! It is not too late.